My foray into Greek cuisine has not been one of a traditional route. 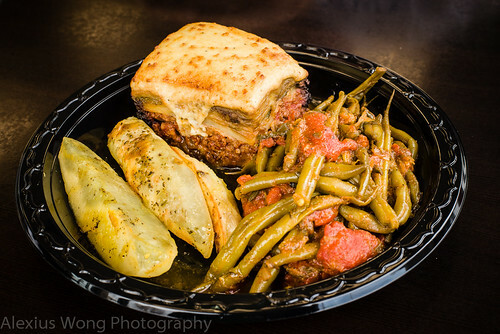 In addition to frequenting a popular take-out diner in the Dupont Circle area for many years as a young adult, I would scout out Greek Festivals to find cookouts hosted yearly by the myriad of Greek Orthodox churches in the Washington DC area. It was there that I could get a true sense of what traditional Greek cuisine was about. However, I have not come across many Greek restaurants in the area beyond the gyro counter, thus the absence of a blog on this culinary tradition uptil today. However, recently as I was driving up Route 1 heading to Beltsville, I noticed this new establishment tucked in a strip mall, just north of IKEA and the Beltsville Agricultural Research Center. After a couple of weeks, I decided to pay Yia Yia’s Kitchen a visit, and admittedly, with a bit of lowered expectation stemming from my experiences with similar style places. But walking in, I was impressed by the place that looks very neat and well-kept, bright from being a corner shop lot bathed in natural light coming through the large windows facing the traffic-laden highway. Within my first bite, I knew that this was not the usual joint serving this Mediterranean cuisine. After a handful of visits, I decided to write this blog. 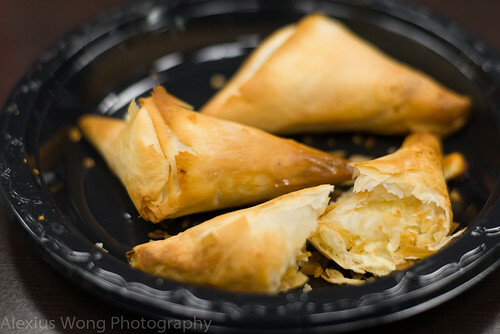 Some of the highlights of tasting food at Greek Festivals were new dishes that I could explore and enjoy, and savory pastries were some of my favorites. My first order here was Tyropita. The pies were airy and crispy from the well-baked Phylo sheets, enclosing an equally light yet rich stuffing of ricotta and feta cheeses. The tanginess of the feta was not too pronounced, tampered by the smooth ricotta, and it was the perfect foil to the mild tasting crispy exterior that literally flaked apart between my fingers – a light and flavorful starter indeed. 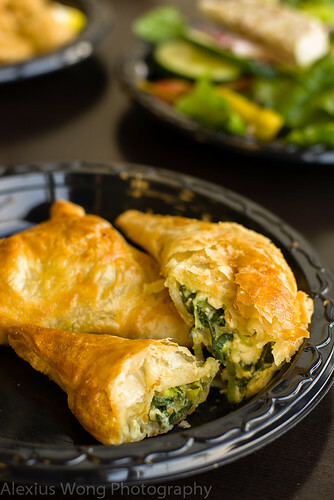 Another visit’s order was Spanakopita. The dough of these pies were quite different from the above, being equally light but softer akin to a crispy croissant, encasing a stuffing of spinach, leeks and feta cheese. I really enjoyed these savory bites with the feta tanginess tasting creamy, perfectly matched by the sweet onion notes of the leeks which seemed to be more prominent than the spinach. Both types of pies were made to order judging by the flaky warm dough and their fresh quality, and they were the perfect meal opener due to their savoriness and lightness. Looking at the menu, I knew I had to sample a couple of types of appetizers. The Fried Calamari definitely called my name on each occasion. The plate arrived with thick rings of squid, along with a few tentacle blooms, lightly battered and served with lemon and Tastziki yoghurt sauce. One bite into the seafood was revealing. 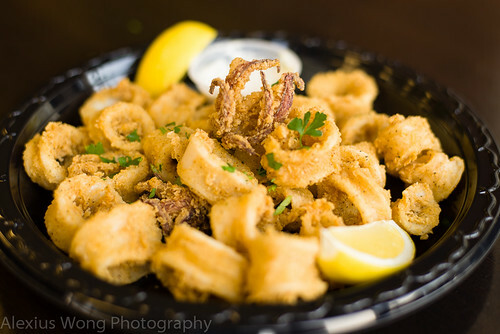 The batter was lightly seasoned with salt and pepper, crispy but lightly coating the squid rings that were quite tender to the bite. Being made from whole squid, this was as good as it gets, and at one visit, they literally disintegrated with a couple of chews. The frying was nearly greaseless and the seasoning right as to not overwhelm the mild mollusks. A squirt of the lemon wedges took me to the Mediterranean seaside with these bites. Even though the yoghurt sauce was well-made and flavored with fresh dill, I didn’t feel that it added much to the seafood. The portion was quite huge as an appetizer, but it is worth ordering and sharing with others. A visit on a cold day called for the classic Greek soup – Avgolemono. The first mouthful brought a smile to my face. 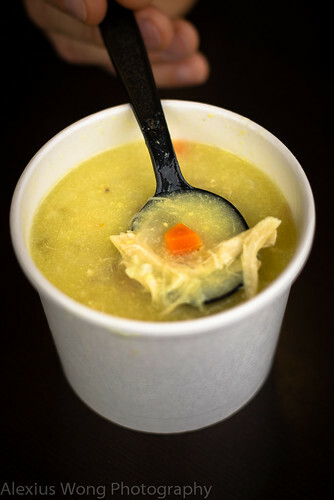 It is basically a well-made chicken soup, full of flavor of vegetable aromatics of onions and carrots, and without artificial flavor enhancers, laced with pieces of carrot and strands of chicken, and thickened with cooked rice and egg. But what takes this basic soup to another level is a tinge of lemon juice mixed in with the richness of the egg. I must say that I enjoyed these sips very much with the lemon tang beckoning my tongue for more each time. It may not be a cup of tea, or bowl of soup, for the uninitiated, but I really enjoyed this classic soup, me being one with an affinity for the sour and tangy flavors. Even without the lemon, this is a damn good soup. . . . Walking into the eatery, you immediately notice three gyro spit roasters behind the counter heating away different types of meat judging by the colors of each meat cylinder. An order one day was made with pork, which is a popular choice on the Greek islands. 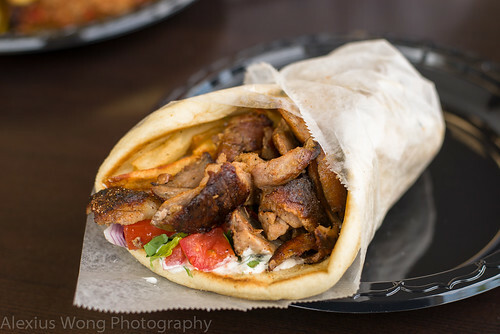 The meat pocket was a combination of pita bread wrapping together a filling of shaved roasted pork (not processed pressed meat), fries, bits of tomato, onions and lettuce, moistened by some yoghurt sauce. The bits of meat were slightly crispy on the outside with more moist bits seasoned by a mild concoction hinting of oregano and thyme. The pita was amazingly soft and pillowy tasting freshly made. I found the fries stuffed into the gyro unnecessary and I removed them quickly. A friend’s order made with beef and lamb was equally satisfying for him, and I could taste some of the unique and mild gaminess associated with these cuts. Another day’s order of the Souvlaki was equally tasty with cubes of pork being well-marinated and well-seasoned but perhaps a bit dry due to that lean cut of meat. 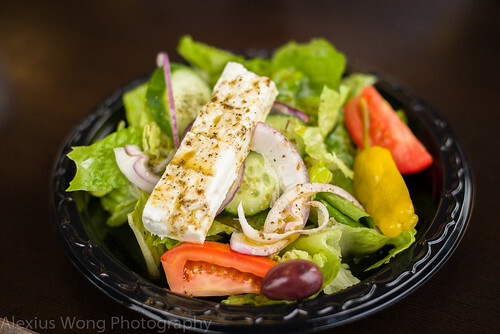 A side of Greek Salad was the perfect accompaniment for its fresh quality ingredients and flavors found in the vegetables and leaves, the block of quality feta perfectly brined and sprinkled with some dry oregano, all moistened by a lemony vinaigrette made with good olive oil. As a side salad, the quantity is a good healthy portion for most. Greek main dishes have always had much appeal to me due to their refineness in preparation and flavors as I have savored in those Greek festivals. A friend’s order of Moussaka was a revelation on a visit. The pie is made with layers of Bechamel sauce, eggplant, meat sauce and slices of potato, all cooked to form a single lasagna-like entity. This version blew me away on many levels: the bechamel sauce was the right amount of creamy richness hinting of some nutmeg in it, the eggplant moist and thin, the meat sauce perfumed with some cinnamon and clove, and the potato still a bit firm but cooked. The seasoning was perfect and the use of spices subtle yet present. The pie could be cut with a fork and there was a lightness to it pointing towards to a delicate and knowledgeable hand. The green beans side was also well-executed with the whole vegetable fully cooked (Mediterraneans prefer their veggies this way) without turning to mush, slightly acidic from the whole tomatoes, sweet from the onions, and seasoned with fresh mint (not dry mint like some do) that added a fresh bright quality to this side. The side of potato wedges was mildly seasoned and still a bit firm from the roasting. Another friend’s order of Pastichio was very much like the Moussaka but made with cooked macaroni added to the meat sauce and topped with the Bechamel sauce, which he found equally savory and satisfying. I have to admit that that is the best Moussaka that I have bitten into, enough to give any Yia Yia a run for the money. After the urging of the owner on a couple of occasions, I decided to try the Kokkinisto dish. The plate arrived with pieces of short ribs sitting on a mound of mashed potato. Admittedly, I was not too impressed by this rather gray looking dish, but the first forkful spoke another language. The pieces of meat tasted full-flavored from some pan-searing and simmered in red wine and probably some rich stock. There was a subtle back note seasoning that I could not discern, but the gestalt in flavor was tongue-tickling. 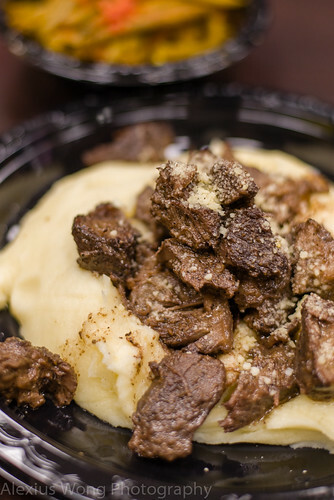 The background player was not insignificant; the mashed potato was made from scratch tasting freshly made and a bit rough in texture, enriched by some stock and a hint of garlic, and it provided the perfect companion to the beefy bits. The portion was very generous and I could not finish but half of the serving, to which I savored it delightfully encore the next day. 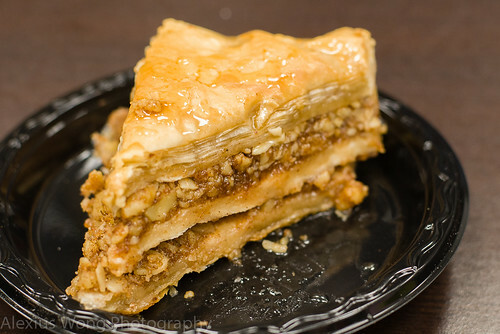 I knew I couldn’t write this blog without including at least one of their desserts, and I decided to order the most recognizable sweet bite, Baklava. This healthy serving was full of roasted nuts separated by layers of Phylo and soaked with syrup to provide the sweet and moisture to each bite. What raised my eyebrows and brought a smile to my face was the use of cinnamon which tasted extremely fresh and zingy. The Phylo on top was flaky but the middle layer of pastry was a bit too thick and was not thoroughly cooked. However, the flavors were spot on and I appreciated the right amount of sweetness without being cloyingly sweet like other versions I have tasted. 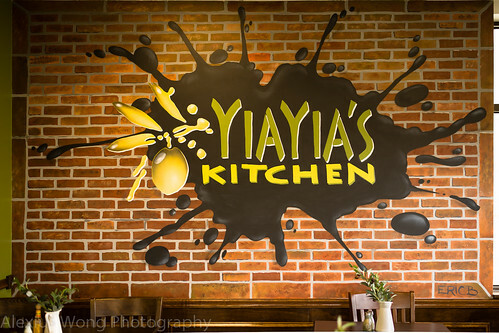 Yia Yia’s Kitchen is a great find in the DMV area where Greek food is not common and it’s quality cooking hard to find. The freshness in the ingredients and the cooking are consistent in this place, from the simple Greek Salad with the tasty and briny Feta, to the amazingly light and flavor-packed Spinach and Feta pies, to the well-seasoned roasted meat in the Gyros, to that oh-so-good Moussaka that can be eaten any day, to the oh-so-beefy meat-red wine stew matched with an equally tasty mashed potato. 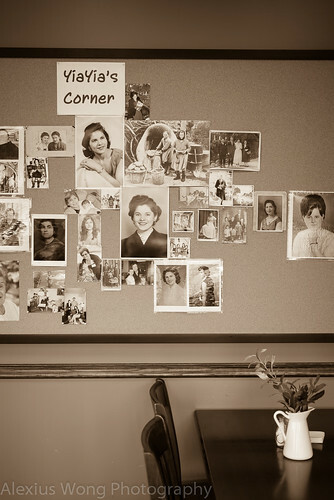 And that corner dedicated to all the Yia Yia’s and their cooking is so endearing. I think the superb cooking here would bring a smile to the photo of each of the grandmothers, making them proud that the name of the restaurant is in honor of these great cooks.